Since many years we are experienced in the installation of boathouse storage solutions which help to organize a safety and space saving storage of boats, oars, sculls and other rowing material. - Single Arm Boat Racks with Fix Arm and Rubber Padding Surface. Surface. The Slide Arm version is called "Opelit-Rack". 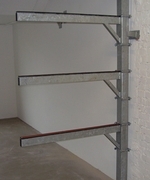 - Vertical U-Posts of galvanized steel. - Horizontal U-Profiles of galvanized steel. Boat Storing at nearly every position in your boathouse. - Scull and Oar Storage. Sweeps in a bracket of the same size. - Storage for Gig-Boat Rudders. - Storage for Bow and Stern Covers of Gigs. - Storage of Coxwain Seats of Gigs. 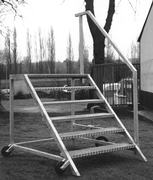 - Roller Steps for boat storage in upper Racks with 2 to 5 steps. - Movable Carriage with 4 or 5 Racks in height to store 4 or 5 Singles. - Detached external Racks with Rubber Padding Surface.